Love it up, drink it down! 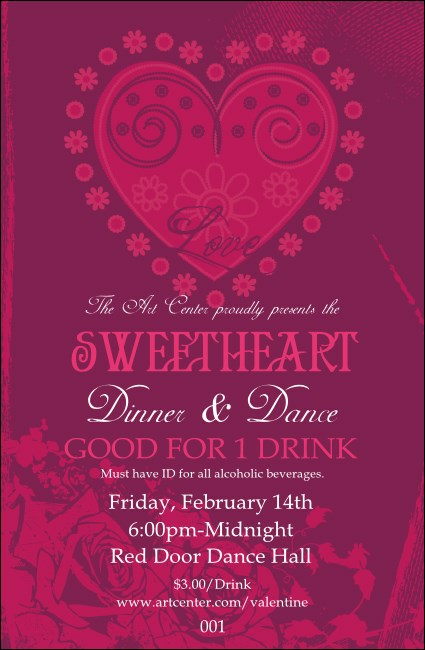 Don't let the drink line get sloppy this February; keep everything orderly and beautiful with the power of the Valentine Heart Drink Ticket. This template comes with a flowery pink design and security numbering. It's a simple way to track sales while adding some joy to the festive atmosphere at any romantic event. Quench your thirst with the right Drink Ticket from TicketPrinting.com.